This article was originally published on November 19, 1914, but the newspaper's name has been snipped from the clipping. The article was a part of Barney Oldfield's personal scrapbook and is in better shape than most of the material from that source. The article reports on the progress of the 1914 Los Angeles-to-Phoenix off-road race, aka, "The Cactus Derby." The cars had traveled from Los Angeles to Barstow with Oldfield leading. Other drivers in the mix were Olin C. Davis (Simplex), Louis Chevrolet (Chevrolet) and Cliff Durant (Chevrolet). 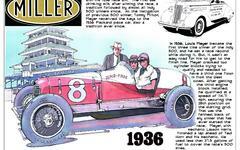 Chevrolet, Durant, and Oldfield also raced in the Indianapolis 500. It is interesting to note that Louis Chevrolet had left Chevrolet Motors by this time - after a falling out with Cliff's father: William Crapo Durant. Why the son hired Chevrolet would be an interesting story to get at - and if anyone knows, fill me in!